Kiefer B. Sauls attended Brigham Young High School and graduated in College Hall on Thursday, June 3, 1915, earning a BYH Commercial Diploma. Born on August 14, 1896 at Grays, South Carolina, his parents were John Wilson Sauls and Mary Terry. Beginning in 1921, he served in the highest levels of the University's leadership for fifty years, holding the position of Treasurer until his retirement in 1971. 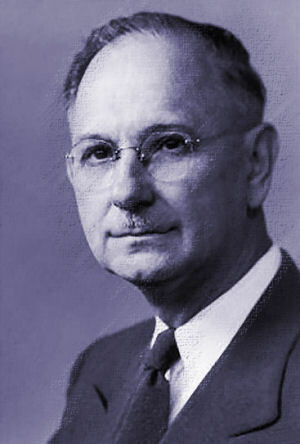 Mr. Sauls served as confidential secretary or presidential assistant to three BYU presidents. The three included: Franklin S. Harris [BYH Class of 1904], Howard S. McDonald, and Ernest L. Wilkinson. Mr. Sauls married Elizabeth Cannon on August 19, 1932. They have one daughter, Mary Alice Sauls, BYH Class of 1952. Mary Alice married Stan Collins, BYH Class of 1951. "Kiefer B. Sauls is one of the quietest men on our campus, but has a profound knowledge of students and events," said T. Earl Pardoe, faculty member since 1919 and head of the BYH Speech Department until 1952. "As secretary to the President for a decade, purchasing agent for two decades, and Treasurer of the University since 1939, he knows the very heart of the school's financial struggles, the lowest depths of most of the student's pockets, and the extreme limits of the faculty's solvency," Pardoe continued. "One of our punsters has remarked, 'There's a man who knows what cents the faculty has.' He is a keen observer, a thinking man who listens and honors confidence, an expert counselor, a faithful churchman of extended experience. 'When he speaks, it is wisdom,' said one of his closest friends," concluded Pardoe. 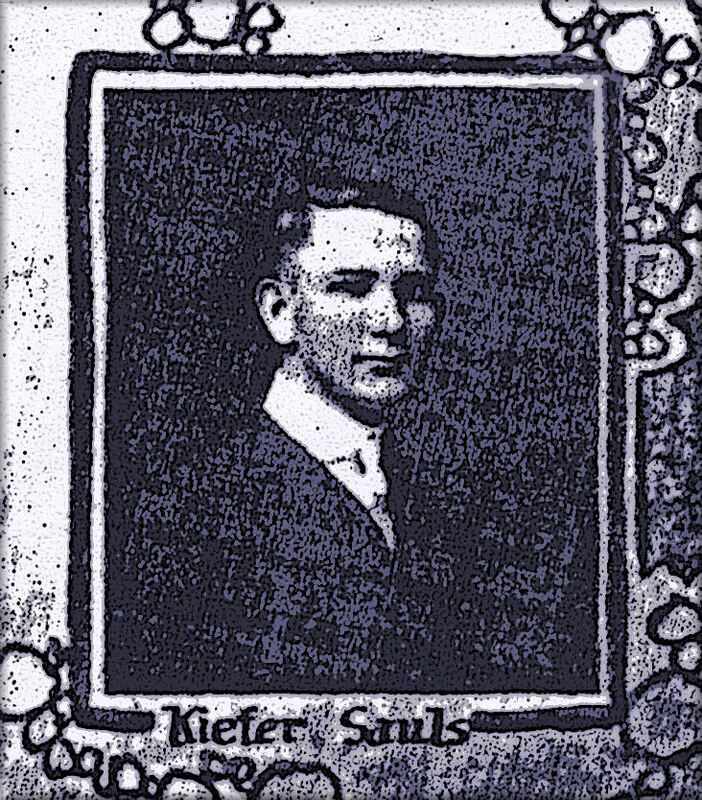 Kiefer B. Sauls, Class of 1915, in 1928. One of the most interesting adventures of his busy life came in 1929 when he served as Secretary of an American commission to Russia in search of territory for Jewish colonization in that nation. He accompanied Howard S. McDonald, chairman of the commission. 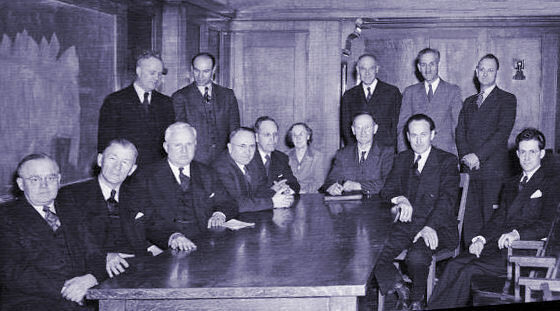 Kiefer Sauls first became Secretary to BYU President Franklin S. Harris. Much later, Sauls recounted Harris' vision and educational philosophy: "He immediately charted an ambitious course for the destiny of BYU as he envisioned it and set sail. I once heard a faculty member philosophize about a young man with grandiose plans; it was thought the young man's sail was too big for his rudder. President Harris's sail was big, but the rudder proved adequate. . . . Dr. Harris believed in a well-rounded education. He had one. He had a better working knowledge in more fields of learning than any person of my acquaintance. Though his major field was science, he loved the classics in literature, art, and music and knew of the accomplishments through the centuries of the great artists in these areas." 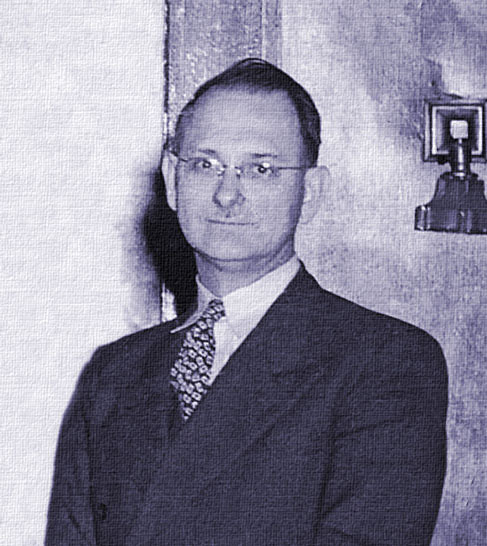 Kiefer Sauls also worked as a secretary for BYU President Howard S. McDonald. This was when he also served as secretary of the delegation to Russia of which President Franklin S. Harris was chairman in 1929. "It is a distinct honor to have the privilege of presenting Kiefer B. Sauls to receive the Alumni Distinguished Service Award. "He is a man who is modest, retiring, and somewhat bashful in his disposition. Because of these traits, he is not as well known as some other members of this association. But his career has been one of continuous service to Brigham Young University. "He has been Treasurer of the University for many years, Secretary of the Board of Trustees, and Assistant to the President. "In addition, in times past he has been in charge of many of the auxiliary services of the institution such as housing, the dairy, the laundry, the post office, etc. "In religious matters he has also been active. He has served in a ward bishopric, and at the present time he is a member of a High Council in one of the Provo stakes. "But in spite of his modesty, he is venturesome. Recently he has invaded the field of politics. I saw him two or three days before the recent municipal primary election. 'Kiefer,' I asked, 'how is the politician?' 'Well,' he replied, 'I am not much of a politician, but I am learning.' Then he added, 'I am getting my eyes opened,' -- and I suspect that they were opened still wider after the election. "I should like to be personal for a few moments. During the two periods that I was 'Acting-President' of the University, Keifer Sauls was my right-hand man. "He knew more about the details of university administration than any other man on the campus. I leaned on him heavily. His office was just across the hall from mine, and there was a beaten path between the two offices caused by frequent conferences and consultations between us. "Kiefer was a very much appreciated member of the Brigham Young University staff. It is, therefore, a very great honor and pleasure that I now have in presenting Kiefer B. Sauls to receive the Alumni Distinguished Service Award." Mr. Sauls received a standing ovation. "Some of the wittiest bits in the various faculty programs have come from the lips of Kiefer," noted T. Earl Pardoe. "His spontaneous responses to a situation often silenced his colleagues or brought subdued reaction from the more vocal. When two of his friends left each other in strong disagreement, he turned to us and said, 'Anger is transitory; love is much more durable.' His life is one of service and patient understanding." Kiefer Branham Sauls died on March 28, 1980 in Provo, Utah. 1. Thomas L. Martin (Dean of Applied Sciences) [BYH Class of 1910], 2. Christen Jensen (Dean of Graduate School), 3. Franklin S. Harris (President) [BYH Class of 1904], 4. Asael Carlyle Lambert (Dean of Summer School) [past Principal of BYH 1926-1928], 5. Amos N. Merrill (Dean of Education School) [past Administrator of BYU Laboratory Schools 1912-1921], 6. Henrietta Neff Smart (Dean of Women) [BYH Theology Faculty at various times between 1907-1924], 7. John E. Hayes (Registrar) [BYH Classes of 1903 and 1906], 8. Gerrit de Jong, Jr. (Dean of Fine Arts School), 9. Thomas Broadbent (Dean of Extension Division) [BYH Languages Faculty 1935-1939], 10. Herald R. Clark (Dean of Commerce School) [BYH Class of 1910], 11. Wesley P. Lloyd (Dean of Students), 12. Carl F. Eyring (Dean of Arts and Sciences School), 13. Wyley Sessions (Dean, Division of Religion), and 14. Kiefer B. Sauls (Treasurer) [BYH Class of 1915].